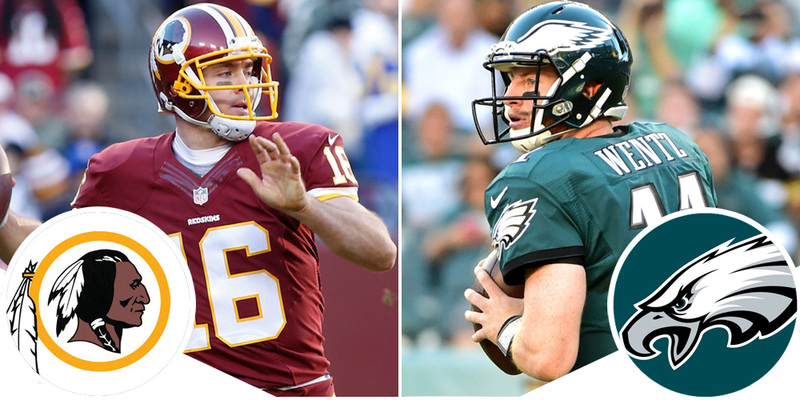 This Monday, the Washington Redskins and Philadelphia Eagles face off in an NFC East showdown with a lot on the line. Only the one game separates the two teams, with one more game up to Dallas as the division leaders. The winner on Monday goes a long way to securing second place with just four games left to play in the 2018 regular season. This is the 168th installment of this old rivalry, with the Redskins holding an 85-76 advantage. There have been 6 ties. The Redskins were sitting pretty at the top of the division no more than three weeks ago. But that’s a long time in the NFL. Anything can and did, happen in three weeks. Alex Smith took a sack against the Houston Texans which resulted in a badly broken leg and his season was over. The following week, the Cowboys took advantage of the quarterback change on Thanksgiving Day to get a win and steal top spot and just like that, Washington is back in a fight for the playoffs. The Eagles front has built are reputation as a brick wall over the past two seasons. They were the best run defense in the NFL last year on their way to the Superbowl and started this year in similar fashion. However, that brick wall is crumbling. In the last three Eagles games, they’ve allowed an average of 157 rush yards a week. To put that mark in perspective, the Oakland Raiders boast the NFL’s worst rush defense in 2018 and they allow 151 yards a week. It obviously doesn’t help to face Saquon Barkley (101 yards-1 touchdown), Mark Ingram (103-2), Alvin Kamara (71), and Ezekiel Elliott (151-1) in that short time frame, but it’s a lot of ground yards in anyone’s book. The Washington game plan should be to run the ball down the Eagles throat at every opportunity. This offense has been based on the run this year, going for 118 yards a game, led by the man that time forgot, Adrian Peterson. And if you believe in omens, the last time AP faced the Eagles, way back in 2010 as a member of the Vikings, he had 118 yards and a score. After taking over for Alex Smith, the Redskins new quarterback, Colt McCoy, is making his second start of the year. His first was a rocky initiation. He threw 268 yards and two touchdowns, but the Cowboys also picked him off three times as McCoy tried to lead his team to a comeback victory. The explanation is a simple one: there’s no cohesion between him and the receiving group yet. Alex Smith played nine games with these wide receivers and only once in that time did he throw over 300 yards. McCoy has played less than six quarters and less than three weeks of practice with the starting group. And while the Eagles rush defense has been strong in these last two season, the same can’t be said for their pass defense. The “No Fly Zone” has been one of the leakier secondaries in the NFL, ranking 28th for the season with 276 yards allowed per game. Injuries have certainly played their part. Ronald Darby and Rodney McLeod are already on IR, but joining them on the sidelines for this game will be Jalen Mills, Jordan Hicks and Avonte Maddox. They’ve never been more vulnerable to a passing attack and if the Redskins want to keep their playoffs hopes alive, McCoy and his receivers are going to have to get on the same page quickly. The good news for Washington fans is that he gets a week and a half since that Dallas game to work on it. It has been a Superbowl hangover in Philadelphia, which isn’t all that surprising considering the way the city celebrated the big win in February. But the defending champions have had a tough year as they endeavor to defend their title. They’ve stumbled their way to a 5-6 record on the back of an injury-depleted defense and disjointed offense. The Eagles are actually lucky to have five wins. It took a Giant collapse last weekend for them to get to their 5th, after trailing New York 19-3 just before halftime. The defensive unit in Washington has been the team’s strong point this season, but like their opponents, where they are vulnerable is their secondary. The Redskins are doing slightly better than the Eagles in this comparison with 261 yards allowed per game ranking them 23rd on the year. They also rank 23rd in yards per pass attempt (7.8) and 24th for completion percentage (67.3). This plays into the Philadelphia offense perfectly. Wentz wants to throw and throw a lot. He has more than capable wide receivers waiting for the young star to deliver the ball. Alshon Jeffery, Golden Tate, and Nelson Agholor make up one of the leagues better WR trio’s on paper, yet have somewhat struggled to fit the pieces together since the trade deadline acquisition of Tate. The potential is there for some huge days when it does click, and holding them up until then is one of the best receiving options in the NFL. 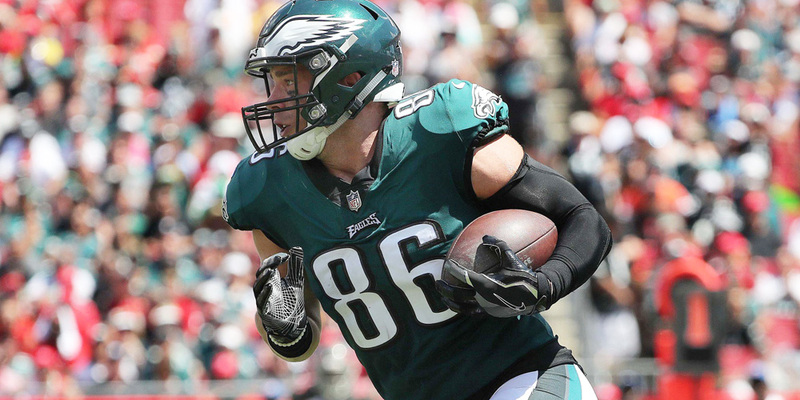 Zach Ertz is arguably the premier option at tight end across the league. He leads the Eagles with 84 catches, 895 yards (both career highs), and six touchdowns. Those are wide receiver numbers. The man is on pace to break Jason Witten’s tight end receiving record of 110 catches from 2012, and become just the 4th tight end to surpass the 100 catch mark. He’s also on pace to top 1,300 receiving yards, which would put him in the elite company of Rob Gronkowski, Jimmy Graham, Kellen Winslow Sr, Tony Gonzalez and Todd Christensen as the only men to break 1,200 yards from the tight end position. What’s more, Ertz plays well against the Redskins. In his ten career games against Washington, his record is 59 receptions, 620 yards, and five wins. He has three games of 100+ yards but surprisingly, just the one touchdown. The Eagles run game has been pitiful at times this season. Jay Ajayi tore an ACL and is on IR, Darren Sproles hasn’t been sighted since the season opener, and the ragtag group of Corey Clement, Wendell Smallwood, and Josh Adams have been doing what they can to contribute to the offense. It has been primarily Adams in the past few games. He saw 22 carries against the Giants, taking it for 84 yards and a score. It was a good outing for the undrafted rookie, but it is also the best rushing day for the Eagles this season, topping Ajayi’s 70 yards in week 4. That says a lot about the state of the run game in Philly. It’s been their Achilles heel in 2018. The whole RPO thing only works if opposing defenses will buy that you want to actually run the ball. Washington is in the top 10 rushing defenses for 2018 (8th), allowing right on 100 yards per game. It’s almost the exact same amount that the Eagles gain every week (100.8) which puts them in the bottom 10 of rushing offenses (24th). Philly needs to get something going here in order to put pressure on Washington’s big men. The question is, can they? I mentioned it before, but in a lot of ways, the Washington offense and Philly’s defense are mirror images of each other. Both units are very poorly, and evenly, ranked across the season. Overall, Washington’s offense is ranked 27th, while Philadelphia’s defense is 24th. On the ground, Washington 13th: Philadelphia 11. And in the air, Washington 25th: Philadelphia 28th. This battle will go a long way to deciding the outcome of this game. The game is in Philadelphia, which judging by other results this season, doesn’t mean much. The Eagles are 4-3 at the Linc in season 53. Furthermore, the Redskins have won five of the last seven matchups between these two sides, although the last two went Philly’s way. Both franchises have everything to play for, but I just can’t overlook the reigning champs at home. The Redskins are on a slide but still manage to cover the line more often than not. They are winners of seven games ATS this year, and five of their last six. The Eagles on the other hand, have an ATS record that reflects the poor year to date. A 3-8 ATS record is not what fans want to see on a weekly basis. Games have all been far too close for comfort, including the 3-point win over the Giants, a game they were favored by five. While I think the Eagles take this one, the fact that all their games have gone this way makes me think that a 6-point start is too generous. For two teams with struggling pass defenses, these guys play a lot of games under the projected points totals. Washington has gone under in six of its 11 games, and Philadelphia has done it one better, with seven. I might be inclined to think that this could go over, due to those two defensive units, but the other side is, the offenses haven’t been amazing either. As much as we’d all love to see another points spectacular, better prepare yourself grind it out affair. That way you’ll be pleasantly surprised if it goes the other way.